"It was the volunteers who were the experts and the British who were the amateurs," says a uniformed man holding an 1871 "Howth" Mauser rifle. The gun weighs nearly 10 pounds and it's an original — the same kind many rebels were armed with during Ireland's momentous uprising in 1916. The man then grips a wooden chair with one hand, the whites of his knuckles showing, "just as [rebellion leader and trade unionist] James Connolly would have done" as he was executed by firing squad, he notes. We're in a mock-up of Kilmainham Jail, where the uprising's leaders were imprisoned and later shot, sandbags piled against the wall behind us. The exhibition in Dublin's Ambassador Theater is being run by Sinn Fein, the Irish republican party historically associated with the paramilitary Provisional Irish Republican Army (IRA), until it disarmed in 2005. It's billed as "the original and authentic exhibition" documenting "the nationalist narrative of what led to the 1916 Rising." The exhibition has been open for two weeks and one of the men on the door estimates 10,000 people have already visited. Every day at noon for 33 weeks an actor dressed as revolutionary Pádraig Pearse ventures outside onto the city center's O'Connell Street to read aloud the Irish proclamation — the document that declared Ireland's independence from the UK. This is just one of many events being held to mark the 100th anniversary of Ireland's Easter Rising — a landmark that means many different things to different people and has awakened a debate on who controls the narrative around historical events, and whether violent uprisings should be celebrated or commemorated more sedately. The Easter Rising has been described as the "beginning of the end of the British empire," an armed rebellion that took place on Easter Monday, 1916, when a group of Irish nationalists including poets, teachers, and ex-British army soldiers took control of locations around Dublin, including the city center's prominent General Post Office (GPO). Though the British — who ruled over Ireland for centuries — were entrenched in World War One at the time, the uprising lasted just five days before it was suppressed, and the majority of public opinion rested strongly against it. However, after 15 of the leaders were executed during the following weeks, sympathy swayed sharply towards the dead and their fight for independence — the ensuing actions eventually culminated in a 26-county republic. Through the last century the Easter Rising has taken on almost mythical proportions in Ireland, being retold again and again through plays, music, and poetry. Though all its survivors have now passed away, many Irish people have some link to those who fought or were involved in the event. Most of the almost 500 people who died during the Rising were civilians, though 107 British soldiers were also killed, including 31 from the Sherwood Foresters Regiment who were ambushed by Irish Volunteers near Dublin's Mount Street Bridge. This has prompted arguments by some UK politicians that those who died on the British side should also be formally remembered. 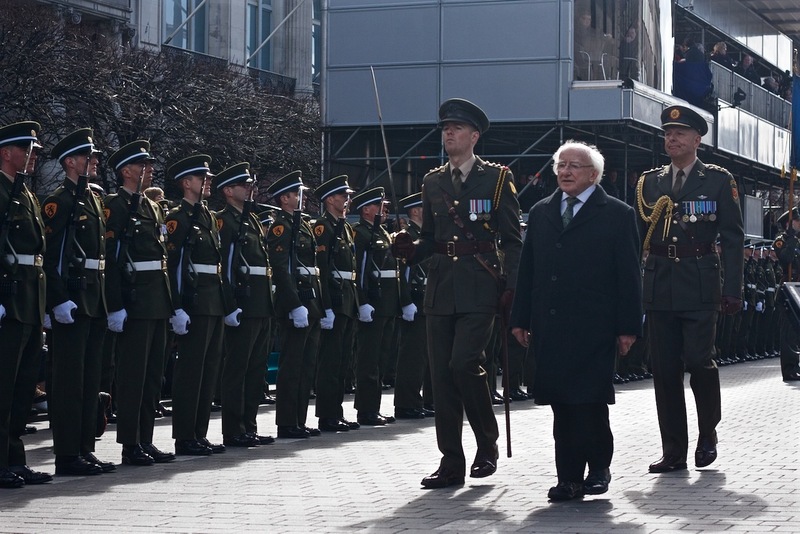 The biggest of 2016's many memorial events in Ireland was Easter Sunday's military parade, which saw thousands of Irish citizens line the capital city's streets to witness more than one third of Ireland's military forces march 2.8 miles through Dublin, with seating around the GPO reserved for dignitaries and relatives of those who fought. Security was tight, with access to the area around the GPO completely blocked off to the public on Sunday. All police leave was reportedly canceled over the Easter weekend because of fears the commemorations could be disrupted by dissident republican groups. Among the thousands of participants in the march were members of the national police force, customs officials, firefighters, the National Ambulance Service, the Irish Red Cross, and the Irish Coast Guard. Armored personnel carriers (APCs), boats, and guns were paraded, while the air force flew overhead trailing the Irish flag. After the marching ended, there was a 21-gun salute. Sheila O'Leary, 94, turned up for the parade at the GPO carrying the medals of her father, Thomas Byrne, and grandmother, Lucy Smyth, who both fought inside the post office. As photographers jostled to take her picture, O'Leary's daughter Maeve asked whether she was getting tired of the publicity or "are you enjoying yourself?" "Yes I am," the nonagenarian replied, smiling. Her daughter explained the family's role was important to them — they wanted it recorded. In a ceremony before more than 3,000 marchers passed by, Irish President Michael D. Higgins laid a large wreath outside the GPO, and the assembled crowd stood for a minute's silence. Seamus Madigan, head chaplain of the Irish Defense Forces, said a prayer in a mixture of Irish and English, before army captain Peter Kelleher read aloud the proclamation that was premiered by Pearse on the same spot 100 years before. Acting as compère was Captain Deirdre Carberry, 29, who has been in the military for 12 years and is involved in human rights and gender training. Her great grandfather Charles Carberry was a member of the Irish Volunteers who fought during Easter in 1916. Carberry told VICE News that her generation remembers the Rising "in a really symbolic way. It creates this distinct sense of what's Irish." "It's very much a commemoration, and a really respectful commemoration," she said. "We are commemorating the lives that were lost as a direct aftermath of the Rising." Though a military parade was held to mark the 50th anniversary of the Easter Rising in 1966, subsequent events were halted by later governments because of fears about how they could be interpreted in the six counties of Northern Ireland — still part of the UK — where sectarian violence broke out in the late 1960s. While that violence has not completely ended today, the 1998 Good Friday Agreement marked an end to a bloody 30-year period known as the Troubles and saw the Provisional IRA enter a ceasefire that lasted eight years until disarmament was completed. Carberry said that as a nation she thinks the Irish republic has "moved beyond" violence, adding that the values outlined in the Irish proclamation — dignity, rights for all, equality for men and women — should still be the values of the Irish Defense Forces today. Others outlined what they saw as the impact of the rebellion on other countries that were once colonized by the British. "The Rising really is Ireland's gift to the world. It showed that the British empire had an end date," Padraig Pearse's closest living relative, English-born Ben Phillips, said in an interview this week. At the Royal College of Surgeons on St. Stephen's Green, another part of Dublin taken over by the rebels, 45-year-old Sergeant Rob Delaney was taking part in a flag party. His great-grandfather, Christopher Poole, was a captain in the Irish Citizen Army in 1916, and also a former British army soldier — he had fought with the East Yorkshire Regiment in the Boer War, and he used that experience to train the rebels. "With my ancestors being involved I do feel a sense of pride," Delaney told VICE News. "I'm proud of what I do and the small part I'll play in the parade." Commenting on the high civilian death toll during the rebellion, Delaney said: "I'm in no position to judge. It was 100 years ago, it's so easy for us all to sit back and analyze now. I suppose in any situation like that there are casualties." Other descendants were more equivocal. "They're celebrating them as heroes now but if they were around today they'd be regarded as terrorists," one relative of a 1916 participant, who didn't want to be named, said. In total, this year's official state commemorative events will include 32 wreath-laying ceremonies and eight guards of honor, along with outreach programs. 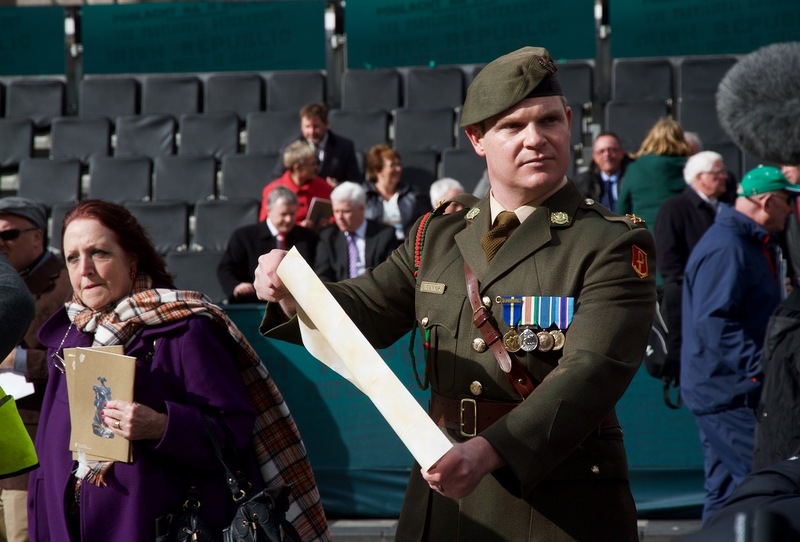 The Irish Defence Forces have already carried out 3,300 visits to primary schools across the country, where they delivered handmade Irish flags and copies of the 1916 proclamation. On O'Connell Street this week, sellers have been marketing themed wares. "Michael Collins on a proclamation poster," one woman shouted, advertising her prints of the Irish revolutionary leader. "Three for a fiver." "Get your Easter lilies, one euro," a hoarse-voiced man cried. "Easter Rising flags, Easter Rising hats," another chimed in. "A lot of the holes in the columns are still there," a GPO passerby with a Northern Irish accent pointed out to a blonde woman walking with him. To his left, a bagpipe player wearing a jersey with "rebels 1916" emblazoned on the back stood rigid as he began to play the song On Raglan Road. In the foreword for an official state program of the commemorative events, a government spokesperson wrote: "For the Irish people to realize their full potential, it was necessary for Ireland to be an independent country." However, President Higgins has also said that Ireland must not "become a prisoner of the past" or "allow any distortions of history." Discussion has also focused on the future for Ireland and Northern Ireland; in a poll conducted this week, 54 percent of Irish people said they would still like to see the island united, despite the unlikeliness of it happening any time soon. Meanwhile, with politicians branding the Easter Rising centenary as an opportunity to look towards the future, some Irish residents are using the focus on Ireland to highlight the country's social issues. On a tour of the streets around the GPO, Tony Duffin, director of the Ana Liffey Drug Project, an organization that works with drug addicts, showed VICE News the 1916 landmarks where heroin addicts openly inject. At least 400 people are shooting up on Dublin's streets monthly, according to Duffin, who quickly spotted abandoned syringes and other drug paraphernalia, and is calling for the next government to bring in a law providing for supervised injecting rooms, which he says could prevent deaths from overdoses that average one a day. Also in close proximity to the GPO, a group of homeless people held a protest on Easter Sunday, aimed at highlighting the country's growing housing problem, while thousands more citizens have said they'll attend a demonstration on O'Connell Street next month to "demand change" against "corrupt" leadership. They have labelled 1916 as "unfinished business."